I’ll wrap up my end-of Autumn posts (as we reach the end of astronomical or “official” autumn) my MINWR adventure with Sarah and Bella Muro. A day after chasing a Brant and Neotropic Cormorant, I met with the Muros late in the morning and we formulated a plan to try and maximize the chances of getting Bella some life birds, namely sparrows and ducks. We headed to Space Coast Regional Airport [map] first, since there are often various sparrows seen there, as well as the occasional Scissor-tailed Flycatcher. While it was probably early for the flycatcher, it was fun to ride along the perimeter road (imaginatively called Perimeter Road) around the airport, then up Tico road (imaginatively named for TItusville/COcoa – the previous name of the airport). 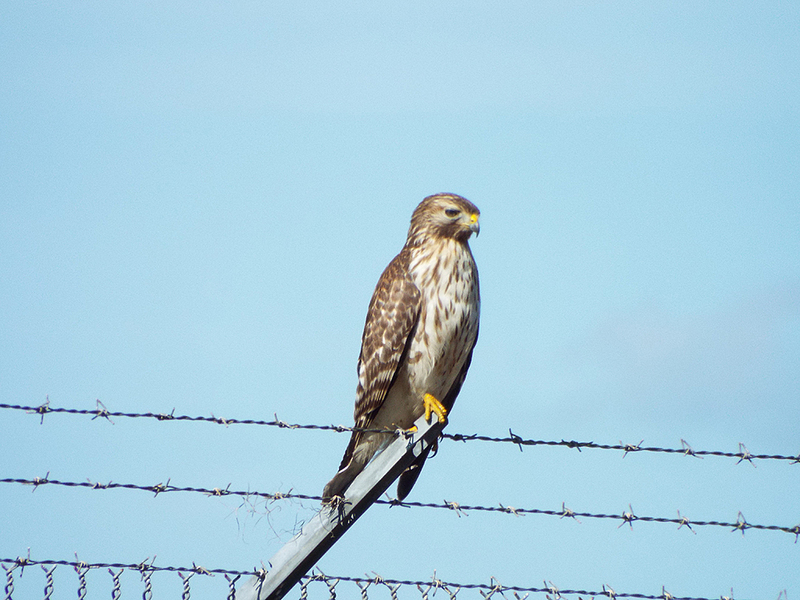 The fence around the airport was strangely devoid of its usual Loggerhead Shrikes, but there were a few American Kestrels and other birds of prey. A young Red-shouldered Hawk was calmly looking about. Its presence may have been partially responsible for the relative lack of small birds along the fence-line. We managed to scare up a Vesper Sparrow on the far end of Tico road, but the look was brief, so we pulled off the road to “chase” it down the fence line. In birding terms, chasing doesn’t usually mean actually running after the bird in sight. It means making a concerted effort to find where the bird may have flushed or flown to, using observation and smart conjecture, based on known species or genus behaviors and the available options. In a larger sense, chasing can mean driving or travelling long distances to attempt to see a specific bird species, but perhaps that sort of chasing deserves its own post. 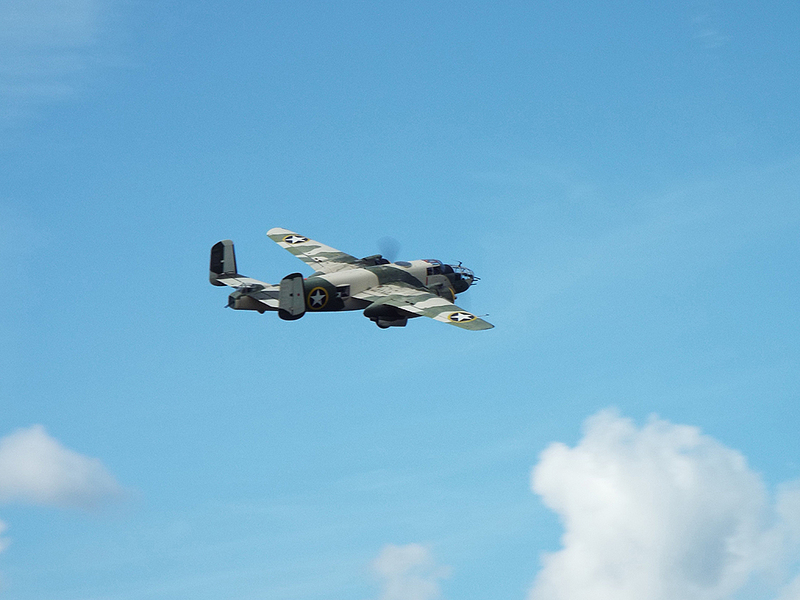 The Valiant Air Command is a local warbird/military plane restoration group and museum with many vintage and historic aircraft on display, with some functional articles, like this B-25 “Mitchell” bomber, named “Killer B”. In the end, we identified the sparrow as a Vesper, by process of elimination based on field marks and habitat. Our next stop was Black Point Drive [map], where we finally did get some more ducks, including American Wigeons, Blue-winged Teals, and even some Northern Pintails. Through most of the afternoon, my poor, fickle camera made photographs quite difficult, so I apologize for the relative lack of photos. 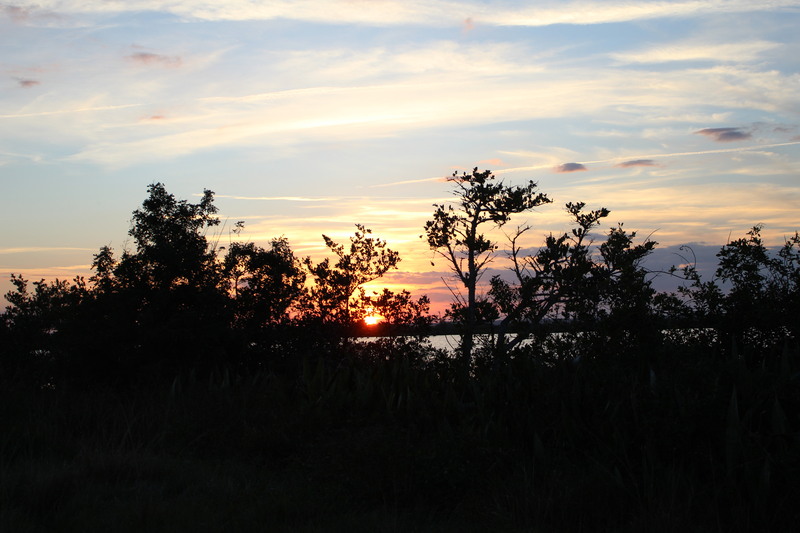 We then went into the Cape Canaveral National Seashore [map]. The road toward Playalinda Beach has several pull-offs (called Vistas) that look out over ponds and wetlands. It was along these Vistas that up to 10 species of ducks were reported during the previous week. The Ruddy Ducks from my adventure with Camille were still there, joined by many Redheads and American Wigeons. But the species we were most interested in seeing were Canvasbacks, which had also been reported there. It took some serious staring: the larger rafts of ducks were at the edge of comfortable binocular range. I did finally get a chance “fly by” of my binocular field by a female Canvasback, but she landed in the midst of the other ducks before Sarah or Bella could positively identify her. We continued to scrutinize the group until finally, two male Canvasbacks swam out from the edge of the group and turned enough for us to see their unique head profiles. Sorry, no duck photos, but Sarah got this shot off for the moment of Bella’s latest life bird! 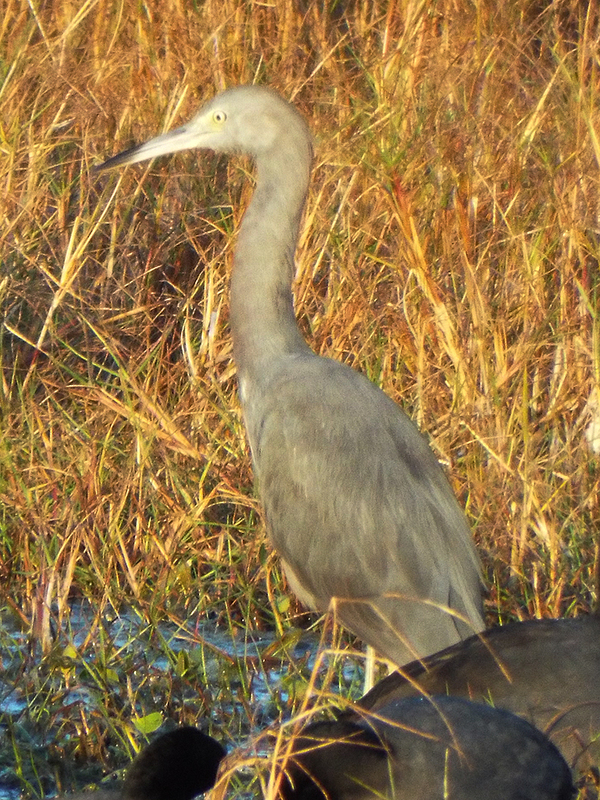 With the light beginning to fade, we went part way along Bio Lab Road [map], where Bella spotted this slightly odd looking heron. At first glance it appears to be a Little Blue Heron transitioning to adult plumage, but to all three of us it’s size and proportions seemed to be off, and it’s plumage was more muted gray than blue. We may never really know, which is one reason why birding is fun and engaging to me. Mystery heron? Hybrid, or just an “odd duck”? We ended the day at Pumphouse Road [map], hoping for sparrows in the last light. 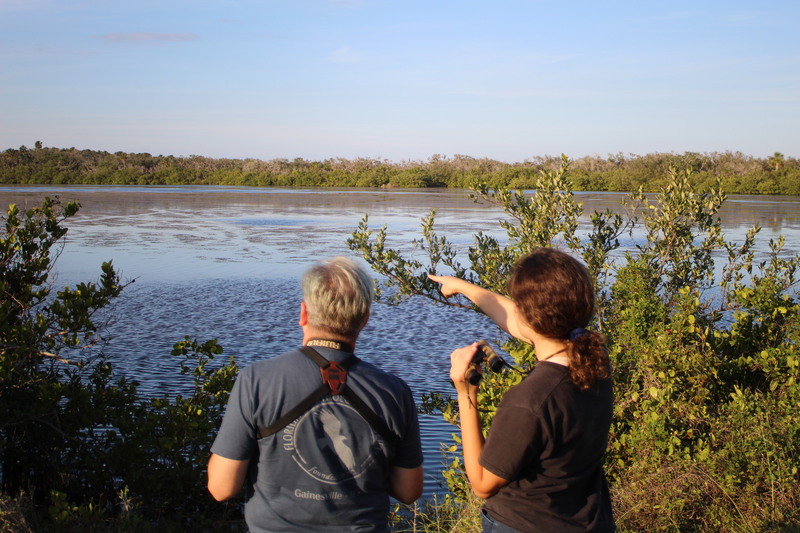 Sarah did manage to catch a glimpse of a very late season (and perhaps rare winter resident) Yellow Warbler in the mangroves. That evening the year’s only “supermoon” – when the full moon coincides with the Moon’s perigee, or closest point in its orbit around Earth – rose on the way back toward home. The final cap on the day was a meteor streaking along the sky as I dropped Sarah and Bella off at their home. What does a self-professed “lonely birder” get out of all this, a busy weekend birding with others? It’s always a pleasure to share a love and passion for birds and conservation with anyone, especially friends. Opportunities to recharge and reset will come. Besides, I also got a hefty serving of some delicious chili from Sarah’s husband, to take home. Sharing food is one of the most powerful and important gestures people can make, so thank you, Chris, for the lovely meal (ok, 3 meals, really). Posted on 2017 December 21 2017 December 22 by Lonely BirderPosted in BirdingTagged Bio Lab Road, Birding, birds, birdwatching, Canaveral National Seashore, Merritt Island National Wildlife Refuge, MINWR, supermoon.